I am starting to look past St. Patrick’s Day towards the next holiday. I understand the next holiday is a religious one and I am not trying to offend anyone but I like to try and find decor that can be used for Easter and transition into spring. This way, I am not required to change my decor in my dining room too frequently. I think I found the most perfect Disney addition to my Easter/Spring table. 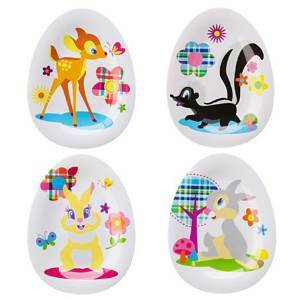 Let’s check out the set of 4 Easter Bambi plates. This set of 4 Bambi plates are said to be for Easter but I think they are easily just spring plates. Yes, they are shaped like eggs but the designs are bright and colorful and springy. The set includes Bambi, Thumper, Flower and Miss Bunny. I can’t even pick a favorite because I think they are all so well done. I like to leave my table set so it looks like it is out of some home magazine and I can just picture these on my dining room table! They are quite reasonably priced for a set of 4, in my opinion. These Bambi plates are only $24.95. You can get free shipping if you purchase over $35. If these look like something you can see on your dining room table or perhaps to even serve your children this Easter or spring, you can find them here. Happy almost Spring and Easter, everyone! Cinderella Day Dress Giveaway from Mom Approved Costumes!